Pop singer Dua Lipa performed an unusual duet with avant-indie artist St. Vincent at the 61st Annual Grammy Awards in Los Angeles Sunday night. The singers kicked things off with a rendition of St. Vincent’s Grammy-nominated “Masseduction,” followed by a little bit of Aretha Franklin’s “Respect” and Dua Lipa’s “One Kiss,” which was originally a duet with Calvin Harris. St. Vincent dressed in all black and played a black guitar solo, as she sang “Masseduction.” Dua Lipa, dressed in black and white, came from the shadows behind her and the two traded verses on the Franklin hit before facing off with each other as Dua Lipa sang “One Kiss.,” which St. Vincent augmented with some elastic soloing. 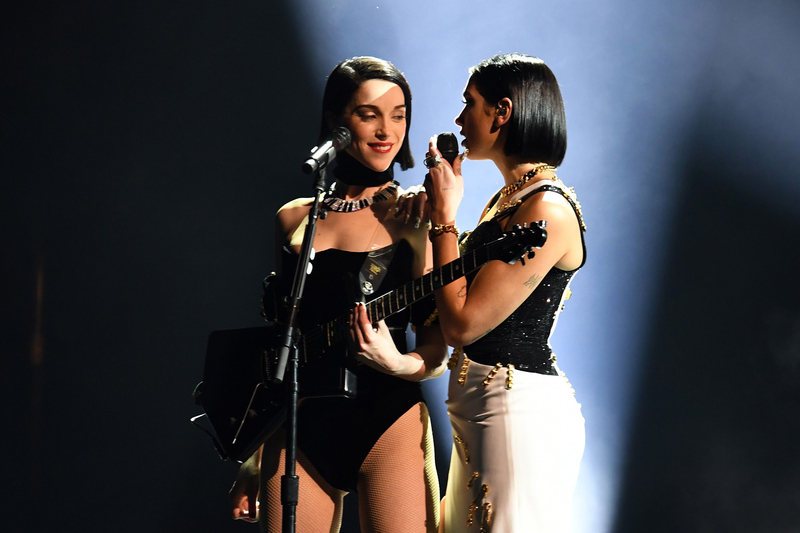 The two looked like strange mirror versions of each other, with their similar haircuts and monochrome outfits, something they bolstered by turning “One Kiss” and “Masseduction” into a duet. Dua Lipa was nominated this year both for Best New Artist and for Best Dance Recording, for “Electricity,” her hit collaboration with Mark Ronson and Diplo’s project, Silk City. Prior to the broadcast, she won the latter award. She released her self-titled debut in 2017, and it’s since been certified gold by the RIAA. “It’s something that I’m really proud of, to see how many women are nominated for the Best New Artist award at the Grammys,” she told Rolling Stone of the Grammys’ recognition in January. “I think it’s really exciting to just be a part of it – it feels like a revolutionary time in music to see so many women be given that opportunity.” Her latest single is “Swan Song,” which appears on the soundtrack to Robert Rodriguez’s upcoming film, Alita: Battle Angel, which is due out on Valentine’s Day. St. Vincent was also nominated for two Grammys this year. She was up for Best Alternative Music Album, recognizing her 2017 album Masseduction, as well as Best Rock Song, for the track “Masseduction.” She won the latter but lost the former to Beck’s Colors. Late last year, she released MassEducation, a stripped-back re-recording of her last album that featured her singing along with only a piano played by Thomas Bartlett. She has played sporadic shows in support of the latter release, which show off a new side to her. In other St. Vincent News, she recently announced that she is serving as producer for a new album to Sleater-Kinney. The band has yet to announce a title or release date for the record. She also teamed with violinist Jenifer Koh last year to pay tribute to composer Philip Glass at the Kennedy Center Honors.